You have a great-looking website with a few opt-in forms, and an amazingly clever landing page with an irresistible lead magnet. Thanks to all the efforts you put into your website, landing page, and lead magnet, you’re getting lots of leads. Converting this enormous number of leads that you have into customers. And that’s where you seem to fall a bit short. What really happens is that very few of these leads stick around with you until the end. This is because customers these days are more cautious and more reluctant to buy your product. They search the Internet for more information, visit websites of other brands that are also selling a product similar to yours, and consult with their peers on social media before making a decision. Which is why a great-looking website with some free resources just doesn’t cut it. You need something more. Something that informs and educates your leads about your product and industry, something that builds their trust and confidence in you, something that convinces them that what you have to offer is the best possible solution available. This is what we call lead nurturing. Simply put, lead nurturing is something that gets the attention of your leads, engages them with your brand, builds trust and relationship, and makes a sales offer to them only when they are ready to make a purchase. What does lead nurturing involve? Why and how are they looking for it? In short, it involves noting down everything that your leads do, how they do it, identifying their peculiar tastes. And then, what’s next? The next step is to use this knowledge to create customized messages that’ll get their attention and actively engage them. What’s the end result of lead nurturing? You send only highly qualified sales-ready leads to your salespeople. It saves resources as you’re working smarter, not harder. Lastly, it gives you a high ROI in terms of revenue and gets your brand great customers that are loyal to you. Lead nurturing depends heavily on your knowledge of your leads and customers. Why would they look for a product such as yours – how can you help them? This process is also called creating a buyer persona. If you want to find out more on buyer personas, here’s a post you should definitely be reading. Lead nurturing also greatly relies on your grasp of your sales cycle, which requires you to map out a marketing-sales funnel. What is this? 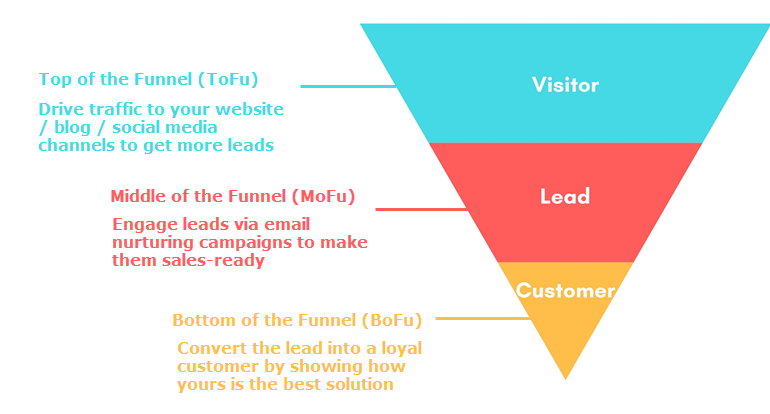 A marketing-sales funnel is something that’ll help you understand the various stages involved in your sales cycle – right from someone’s a subscriber until the moment they become customers. At Route, we go a step further by mapping the best content for a particular funnel stage so that we have an idea of where to begin. You can do the same, if you feel this is something that might work for you. Another thing we do is create contact segments depending on the information we have. We also create segments for the different stages of the funnel. Contact segmentation helps us create messages that truly resonate with our contacts. Find out more about contact segmentation here. 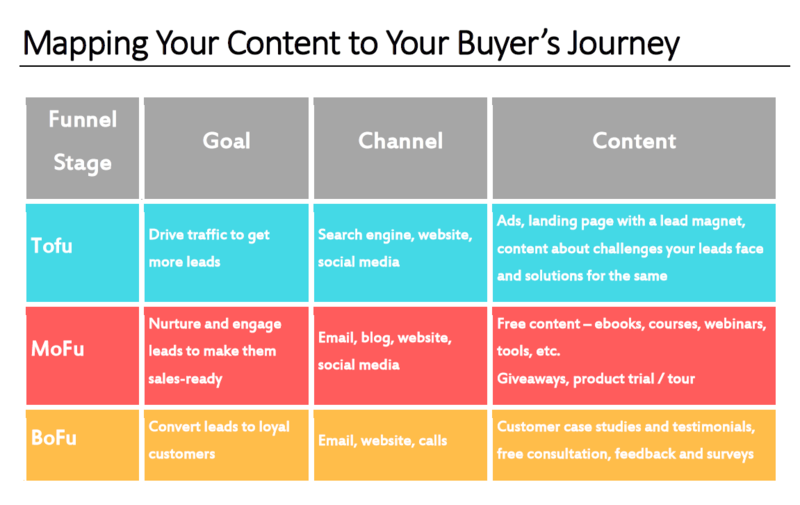 Now that you know who your leads are and which stage of your marketing-sales funnel they belong to, you need one last thing – mapping your content to your lead’s journey based on their interests and their funnel stage. What stage of the funnel do they belong to? What type of content you can share with them to help them with their goals at their present stage? Take a look at the sample case below to understand how this works. Sample Case: Busy Larry is the Marketing Manager for a SaaS company with 70 employees based in California. His job is to manage the marketing department, and to find ways of increasing his company’s revenue. Currently, he uses three different software for managing his sales (a CRM), analytics (Google Analytics), and communication (Email Marketing). His challenge is that he’s using multiple tools to manage his company’s sales and marketing efforts, which takes up a lot of his time and efforts. He wishes to simplify his current situation and increase revenue. Since he’s a busy man, he only prefers emails and rarely has time to communicate on the phone. He also reads posts on growthhackers.com. This is the information that I captured by performing the Who-What-How analysis. He has subscribed for my services after visiting my website and reading my blog content. Busy Larry is now a lead of mine and belongs to the MoFu stage of my marketing-sales funnel. What do I do next? I know he prefers receiving emails above all else. I also know his goal and challenges. So, I’d create educative content on growing revenue as well as talking about the challenges he faces. Next, I’d talk about possible solutions. Since he’s a busy marketing manager, I’d also create content about the different challenges marketing managers face and tools that’d help make their lives easier. The content could be case studies, ebooks, blog posts, email courses, etc. to be sent via email. 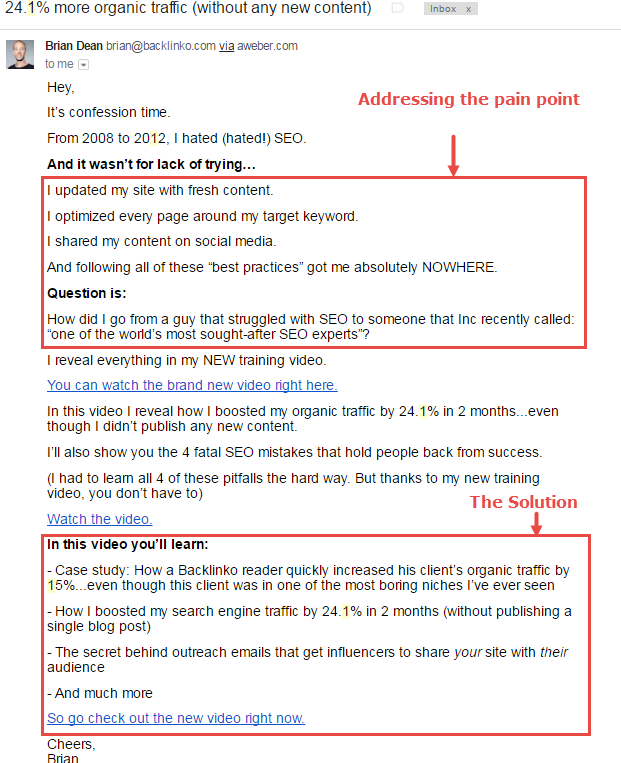 I’d also share my content on growthhackers.com since this is a platform that he tends to frequently visit. Lastly, I’d send him offers that he’d truly appreciate – free resources, free webinars, giveaways, product trials, etc. Once Busy Larry reaches my BoFu stage, I know that all he needs is a gentle nudge. I’d offer a free consultation and request to schedule a meeting. I’d also involve my sales team since my qualified lead is now sales ready. Using the insights that we already have, the sales team would be able to convert with a greater efficiency. 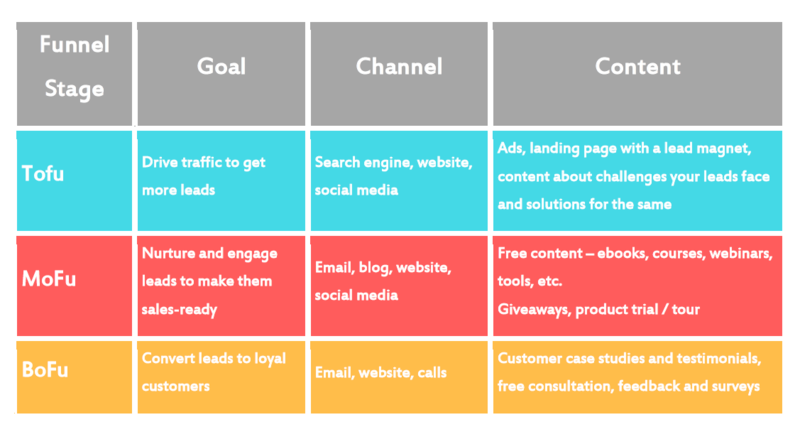 To summarize, we’ve put together a table explaining what content you should be sending for a lead at a particular stage of your marketing-sales funnel. This is something that works for us. Feel free to explore other ways of creating content as you never know what might work for your niche, right? How to Create A Lead Nurturing Campaign Using Emails? 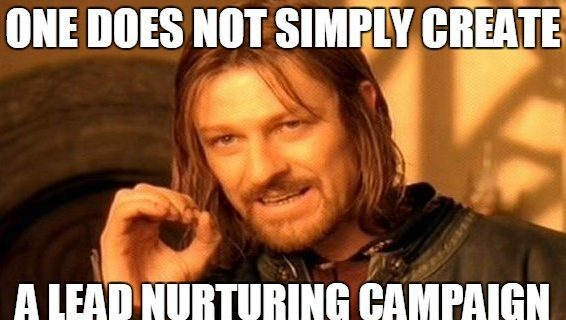 If you did your homework, creating a lead nurturing campaign should be much easier now. You can create lead nurturing campaigns via email as well as social media. In this post, we’re going to cover how to create a great lead nurturing campaign using email. The metrics you’ll use to measure the performance of the campaign – click through rates, replies, bounces, etc. You can create several lead nurturing campaigns. We’re going to share the lead nurturing campaigns that we at Route know work. We hope that these campaigns will inspire you to come up with your own campaigns. 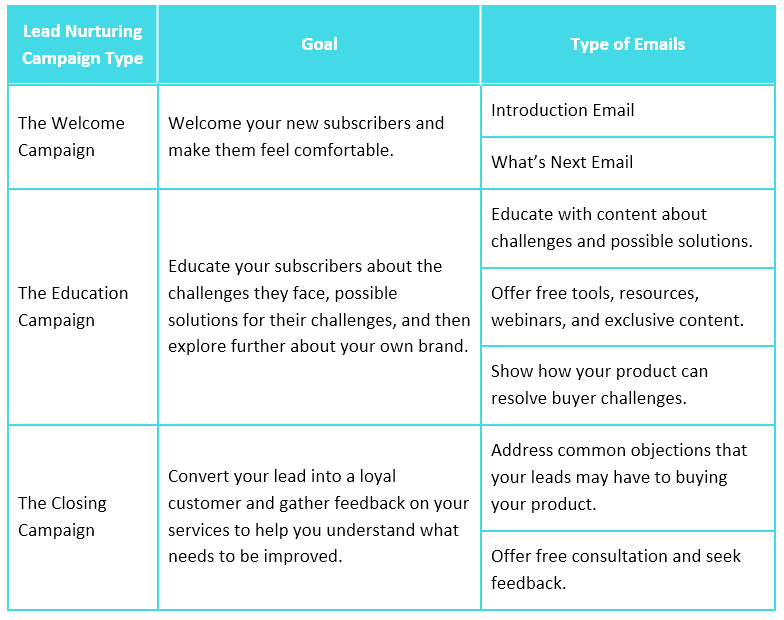 There are three quintessential lead nurturing email campaigns you should be creating to be successful with nurturing your leads. We’re going to label these three campaigns, and then list the types of emails you could be sending for each of these campaigns. We’ve provided ample examples for you to get a clear picture of what’s expected as well as where to begin. Goal: Welcome your new subscribers and make them feel comfortable. This campaign is the most important one as it sets the tone for the rest of your conversation with your leads. You don’t get a second chance to make a good first impression. So make it count. Introduce your brand and what is it that you do. Mention the advantages of signing up for your services. 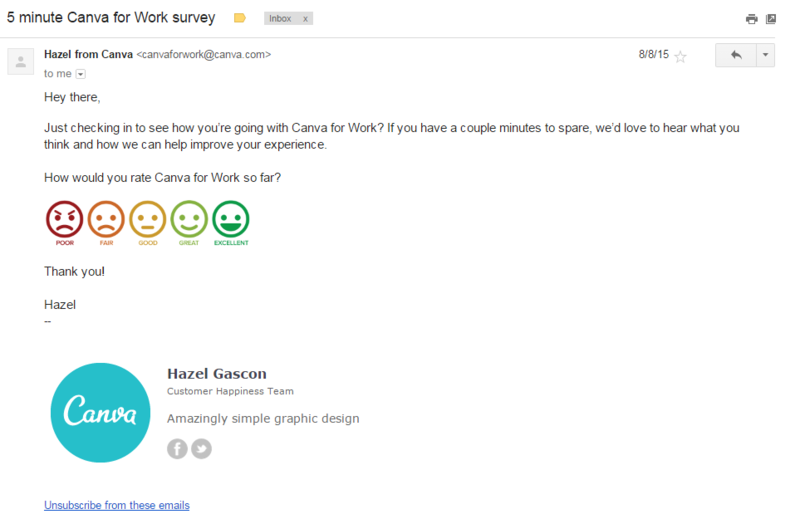 Maintain an easy tone for this email to make your subscribers feel comfortable. Check out this welcome email by Smart Insights. They welcome their leads with a free digital capability assessment, offer several relevant educative content to read, show how they’re different, and share what their customers have to say about them. All of this in one compact email – now that’s what we call a well-planned email. 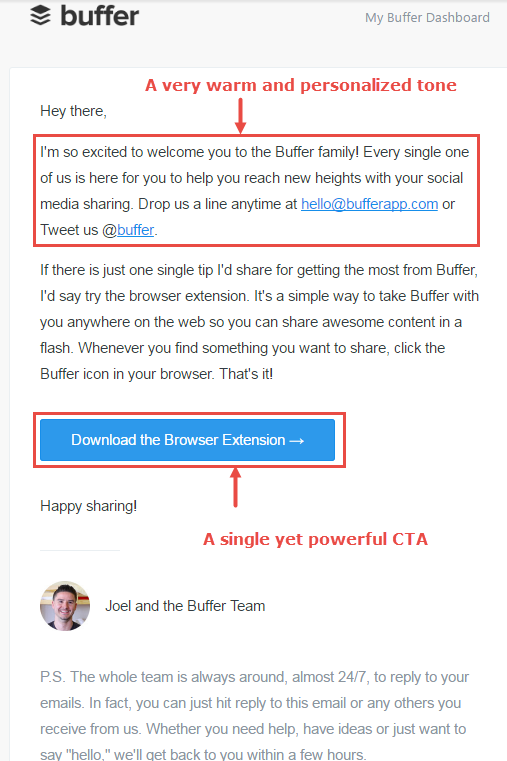 On the other hand, you can also go for a much simpler approach and just send a warm, personal welcome like Buffer does. Clearly outline what is it that you’ll be sending as well as what is it that you expect of your subscribers. Keep the email simple, brief, and clear. This sets the tone for all further communication with your subscribers, so don’t slack off here. Smart Insights does this well by asking their leads to use their toolkits, and by showing them how to best use these kits to get maximum results. Instead of sending two separate emails, you can also send just one email covering both objectives. Garrett Moon from CoSchedule does just that. Like I said before, the welcome email campaign is extremely important. If you need more inspiration to get started with your own welcome emails, take a look at this post on Rob Cubbon’s blog titled How To Write A Welcome Email – 8 Killer Welcome Email Ideas. Goal: Educate your subscribers about the challenges they face, possible solutions for their challenges, and then explore further about your own brand. Now that you’ve set the tone with your welcome email campaign, you begin your nurturing process with this campaign. These emails could explore further the challenges that your subscribers face and how it affects them. Following these, you could send some emails elaborating on the solution that’d help solve this problem. Try not to focus on your brand and instead, just focus on truly helping your subscribers. This is the first step towards building trust and authority. 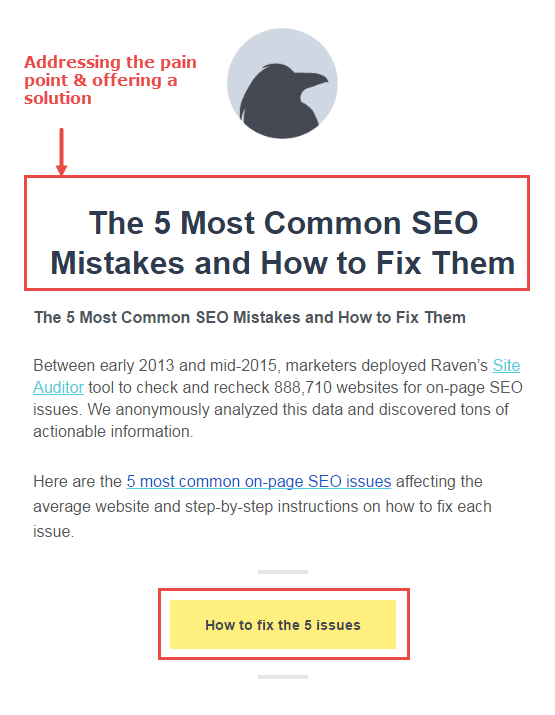 Raven, an SEO tool, does this efficiently with this brief yet to-the-point email. Here’s another example, this time from Brian Dean, showing how he expertly pinpoints the issue that bothers everyone when it comes to SEO and how he offers a solution that addresses this issue point blank. While educating your subscribers is a very good idea, it’s also something that almost every other brand does. Offering something more is one way of showing how committed you are to helping them. These could be free tools, resources, webinars, or exclusive content – something that your leads will truly appreciate and keep them coming back for more. 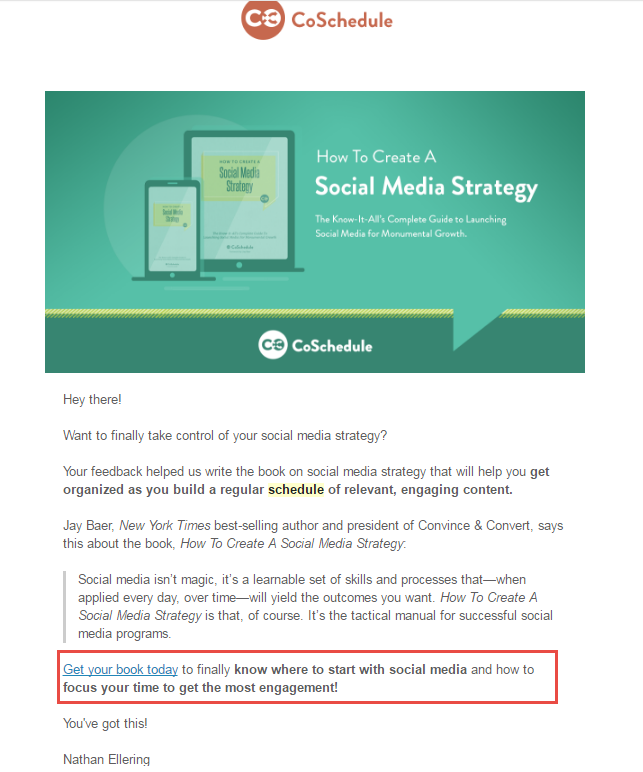 Coschedule sends its subscribers tons of free resources that they’d really appreciate, such as this Social Media Strategy book. 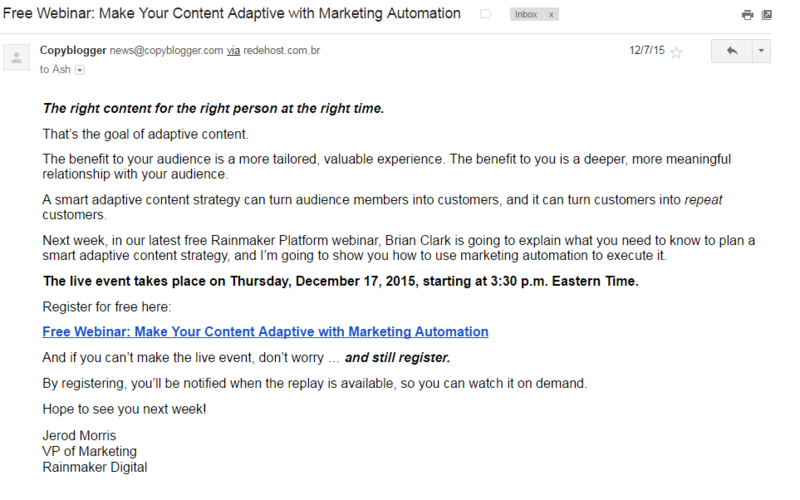 Another example of sharing free content is this free webinar email from Copyblogger. It’s simple, clear, and no-nonsense. You’ve built trust, and authority. You’re also on the right track towards building a long-term relationship with your lead. Now, you need to show them how you can solve their problem. Send emails that show how your product resolves challenges that your leads face, and how you are different from every other solution available. You can send customer case studies and testimonials. Goal: Convert your lead into a loyal customer and gather feedback on your services to help you understand what needs to be improved. A very good way of convincing your leads how yours is a great product is by addressing objections they might have to buy. Ryan Levesque does this brilliantly via his email. What’s more? He goes the extra mile by offering a full refund in case his product isn’t what his leads were looking for. This is the last step towards converting your lead to a customer, so don’t slack off here. Make this email as specific and as personal as possible. 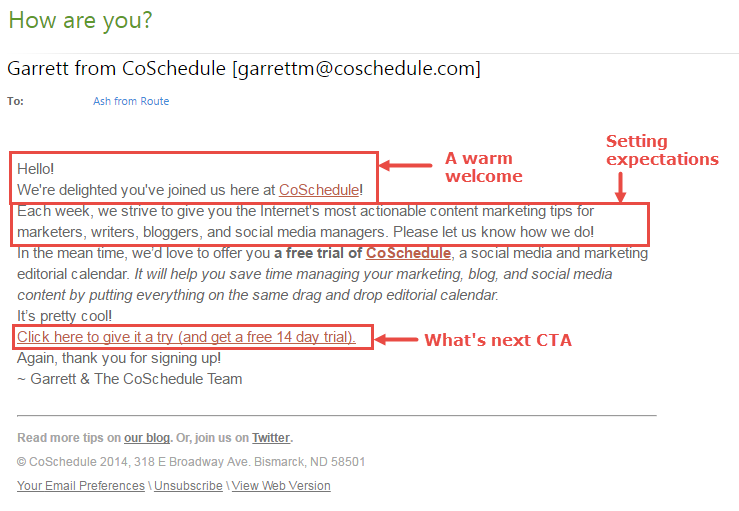 Sproutsocial keeps its email quite brief, casual, and personal. They ask for a quick call instead of a regular feedback via email. Here’s another example from Canva. They keep their email simple, warm, and friendly. 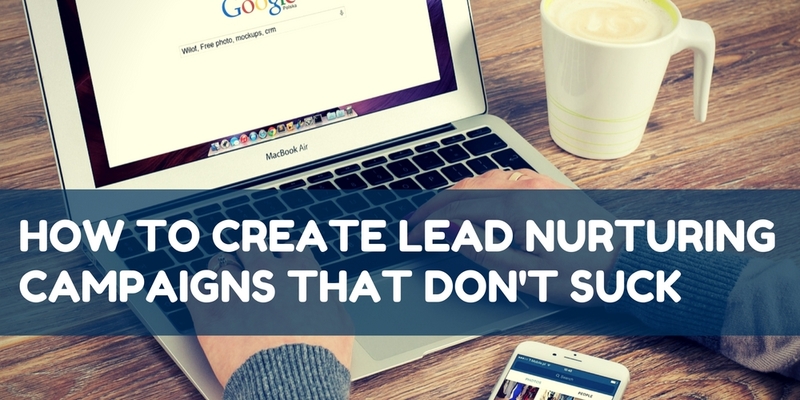 You’ve gathered information on your leads and set up a lead nurturing campaign. Your campaign is actually working and you’ve managed to convert your leads into customers. Congratulations! You deserve a pat on your back as this is no easy task to do. It requires a lot of research, hard work, and a bit of trial and error to be able to convert leads. What are these? What should you be sending? How should you be setting them up? Don’t break your head over it right now. We’ll be exploring these campaigns in our next post. Until then, focus on setting up your lead nurturing campaign and improving it to get better results. Stay tuned and keep using Route. Until next week! I handle Customer Success at Route. Say hi on Twitter @ayswarrya. P.S. : I love nerdy talks, Rock N' Roll, and am a die-hard Lord of the Rings fan. ← Route Updates – Dashboard, Export Contacts and More! Great post Ayswarrya, thanks! Regarding the education campaign + using testimonials: I would love to see more businesses send out (industry) specific testimonials, based on my behavior and/or survey responses. More than often I receive testimonials about businesses that are significantly different (size, industry, challenges, etc.). It is long but it is worth to read. (laughs) Lead nurturing matters for sales because it builds trust between reps and leads. It allows you to slowly build and develop relationships with customers from their first visit to your website to the day they sign on as a customer. Great blog here!